Seton Gordon was only a boy when he began exploring the Cairngorms, fascinated by its wildlife and seeking to photograph all he saw - he later became a pioneer naturalist, photographer and folklorist. He wrote about the land that is Scotland, her flora and fauna, her people, her spirits, her often violent past. He took the earliest pictures of golden eagles at their eyries and throughout the first half of the 20th century came to know Scotland's remotest corners, amassing a unique photographic record, recording the changing social life of the islands, collecting a mass of folklore and historical stories, lecturing and writing both for regular publications and in 27 books. Like John Muir, he was a wanderer and a guide. We walk with him through pinewoods, to eyries, to the corries of the Cairngorms, we follow him trying to recreate the greenshank's song on his bagpipe chanter; and see him holding a snowball windward of a nesting dotterel to cool its panting. Welcomed in croft or palace, a keen piper, inevitably dressed in kilt and bunnet, Seton Gordon was one of the age's great characters. This selection from his writings gives a fascinating insight of the man and his great versatility. 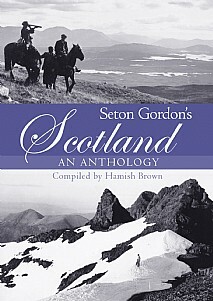 The author, himself a Scottish outdoors enthusiast and well-known author, has been a lifelong admirer of Seton Gordon and his books and has created a book to treasure. A book that is sure to be of enormous appeal to all who appreciate and enjoy reading about the history of Scotland's people, the land and its flora and fauna. It is also an insight into the man himself - unmissable.